During World War II, Allied casualty rates in the air were high. Of the roughly 125,000 who served as aircrew with Bomber Command, 59,423 were killed or missing and presumed killed—a fatality rate of 45.5%. With odds like that, it would be no surprise if there were as few atheists in cockpits as there were in foxholes; and indeed, many airmen faced their dangerous missions with beliefs and rituals ranging from the traditional to the outlandish. 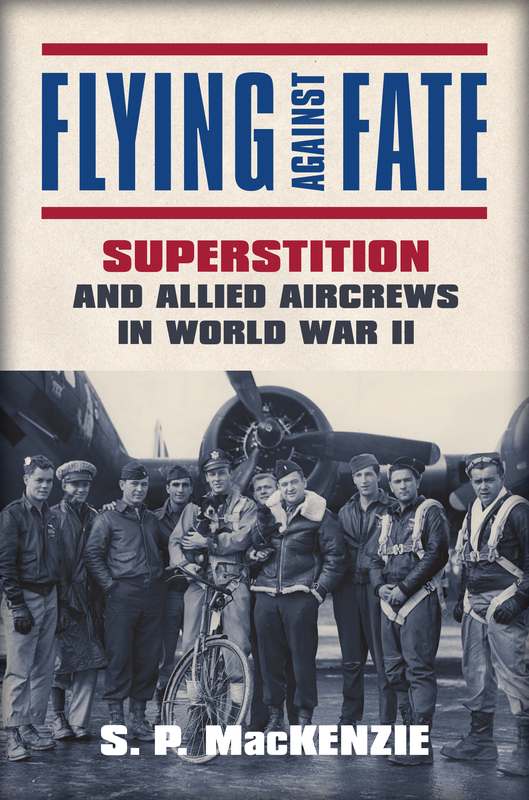 Military historian S. P. MacKenzie considers this phenomenon in Flying against Fate, a pioneering study of the important role that superstition played in combat flier morale among the Allies in World War II. Mining a wealth of documents as well as a trove of published and unpublished memoirs and diaries, MacKenzie examines the myriad forms combat fliers’ superstitions assumed, from jinxes to premonitions. Most commonly, airmen carried amulets or talismans—lucky boots or a stuffed toy; a coin whose year numbers added up to thirteen; counterintuitively, a boomerang. Some performed rituals or avoided other acts, e.g., having a photo taken before a flight. Whatever seemed to work was worth sticking with, and a heightened risk often meant an upsurge in superstitious thought and behavior. MacKenzie delves into behavior analysis studies to help explain the psychology behind much of the behavior he documents—not slighting the large cohort of crew members and commanders who demurred. He also looks into the ways in which superstitious behavior was tolerated or even encouraged by those in command who saw it as a means of buttressing morale. The first in-depth exploration of just how varied and deeply felt superstitious beliefs were to tens of thousands of combat fliers, Flying against Fate expands our understanding of a major aspect of the psychology of war in the air and of World War II. S. P. MacKenzie is Caroline McKissick Dial Professor of History at the University of South Carolina. His many books include The Battle of Britain on Screen: “The Few” in British Film and Television Drama, The Colditz Myth: British and Commonwealth Prisoners of War in Nazi Germany, and The Second World War in Europe.